The last post before the Passage's summer closure goes to Leslie and her rockin' reno. She bought her choker of Chinese freshwater auburn pearls several years ago, from Kojima Company. The pearls were gorgeous, but over time, she found the length shorter and dressier than she wanted, so returned to Kojima for a reno. The reveal says it all! She now has a much looser (in every respect) 37-inch blackened-silver wire-wrapped rope that mixes her auburns with baroque Tahitians, South Sea and Tahitian keshis, Chinese freshwater keshis, two Japanese Kasumis, and the piece de resistance, several large quartz beads cut in irregular, faceted shapes— a graceful, one-of-a-kind composition by Kojima's owner, Sarah Canizzaro. Here is the project en train; Leslie had input throughout. Though she has beading and wire-work skills (we saw her own earring reno here), she called on the pros for this project. #1: Work with someone who knows, and has access to, a wide range of pearls. The box at far right, above, is only a tiny part of Kojima's stock. Few jewellers have an enormous cache of unusual pearls. 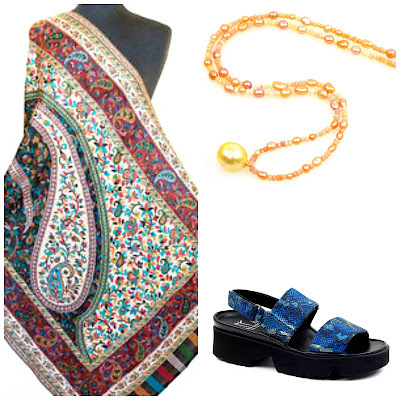 #2: Let the new design suggest the pearl assortment. Women often want to use all the pearls from the original necklace, but that may throw off the harmony. 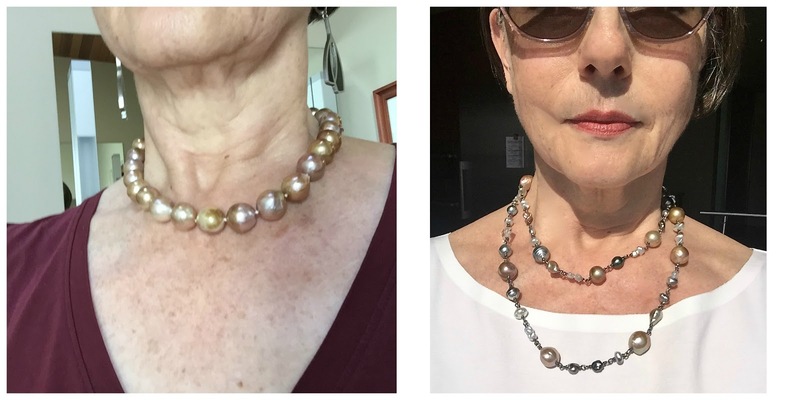 You can use leftover pearls in another piece, or sell them. #3: Give the designer some input, but also freedom. Anyone creating custom work needs to know your preferences; for Leslie, it was a rope casual enough for her jeans and tee. Do you like wire-wrapped or prefer knotted pearls? Gold or silver? Rounds or the more unusual shapes? Is there a pearl variety you've long admired, and would love to slip in there, like a golden South Sea or two, or some glowing akoya keshis? 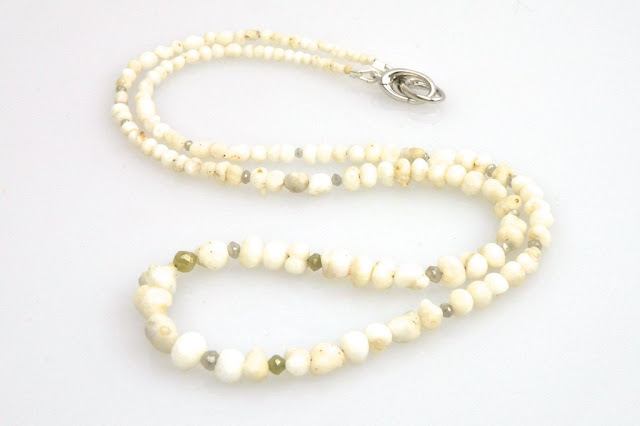 Maybe you want to add gemstone accent beads, or an interesting clasp. If you don't quite know what you want, ask the designer and look at ready-made pieces for ideas. #4: Set a budget, or a range. A good designer can work within any reasonable budget. Leslie's project cost well under four figures. 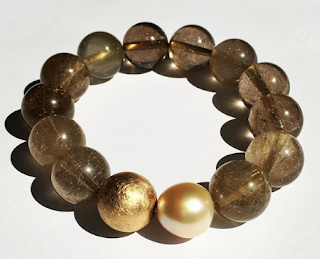 There are ways to extend your budget: choose stunning Chinese freshwaters instead of South Seas, and use other materials, like Leslie's sparkling quartz beads. I would not cut corners with findings, whether silver or gold. If you use gold wire, spring for gold, not fill or plate, which look good right out of the box, but not with wear. First, to Leslie, for her generous sharing of photos. Real-life examples inspire us; they're a gift. A. has a Tahitian choker she feels the same way about; she wore them often in her executive life; now, she's retired and there they sit. 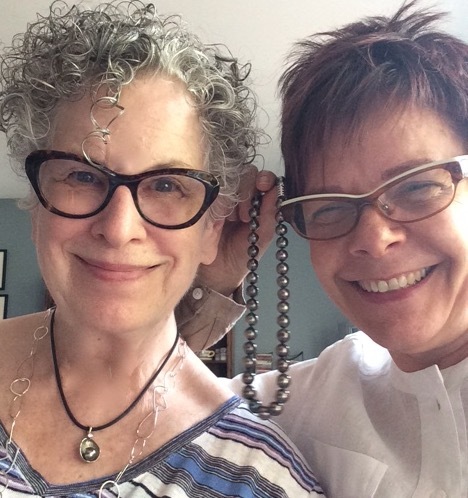 Here we are playing with her pearls, over breakfast; I'm wearing her pendant. 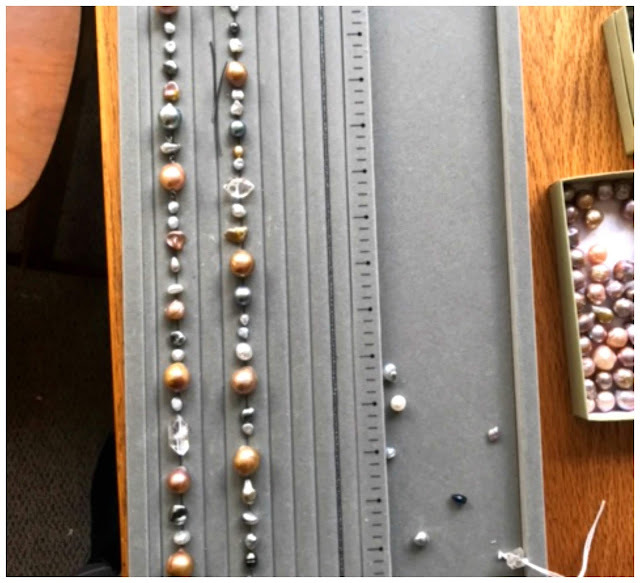 We thought about using metal or gem spacer beads, to add about two inches—but it wouldn't change the formality much, and if spacers are used too repetitiously, especially if of uniform size, the piece looks stiff. Then A. saw Leslie's rope: "This is it! ", she told me. I'll show you her reno in September. Second, to Sarah Canizzaro, Kojima's owner. I have tried to feature other vendors, but there is no one who approaches her variety of fascinating pearls at every price point. She supports sustainable practices, her family's pearl history spans three generations, and she is devoted to clients loving their pearls. Third, to you, for reading and commenting over the past year. 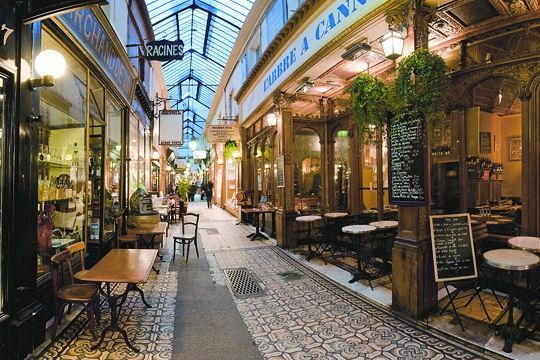 A passage needs its flâneurs! I wish you all the delights of the season; the next post will be on Tuesday, September 4, when the shutters roll open with a happy clatter. Have a lovely break! Am pleased with my perfume decants you wrote about and am very seriously tempted by Kojima! What a successful reno, really shows what can be done. Beautiful result. This inspires me to get cracking on some beads I have that are crying out to be worn. Enjoy your summer! Oh thank you (& your generous friends who have shared purchases & renos) for all the amazing education. I am fascinated by pearls - have been since childhood. The natural variety & variability is fascinating. Truly gifts from the sea to delight us all! Hope your hiatus is filled with delight & many joyous reunions. The reno was fabulous! Have a great summer break! Thank you, Duchesse, for your generous advice and enthusiasm during my reno. The whole process was so much fun and I am thrilled with my new necklace. I will admit that I was a little bit terrified to send my pearls to a stranger without knowing what would come back to me. Sarah could not have been any easier to work with. She is a gem. What a beautiful, hip reno! Goes from casual to dressy and everywhere in between....Thanks for the post and have a lovely holiday. Love the reno – what a great outcome. So versatile. Pearls are utterly fascinating. I always love your posts. Have a great summer.